Rev. 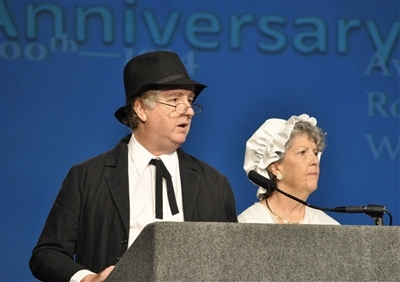 Ivan Corbin and Anita Campbell, in period costume, welcome representatives of churches celebrating milestone anniversaries to Annual Conference 2014. Photos by Steve Wilkinson. 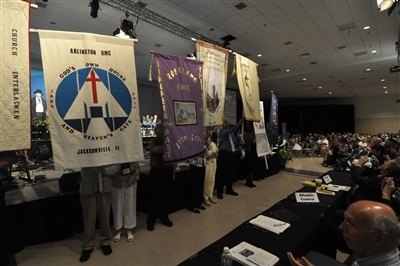 Anniversary churches form a parade of commemorative banners during the Friday morning session of Annual Conference. LAKELAND – More than just withstanding wind and rain, the churches that marked milestone anniversaries at Annual Conference 2014 have weathered seismic shifts in the way people view their neighbors, make their living and express devotion to the Lord. The oldest recognized – First UMC, Apalachicola, and Sardis UMC, Monticello, both 175 years old -- were founded in the Wesleyan tradition long before the Florida Conference was born. 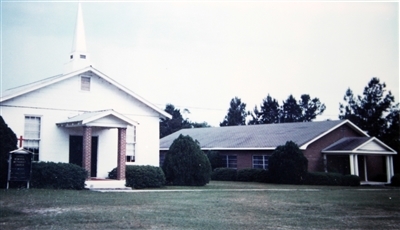 Ebenezer UMC, Jacksonville, owes its existence to the devotion of freed African-American slaves and Civil War soldiers who built a church during an early episode of “white flight” from Florida 150 years ago. Twenty-five other churches ranging in age from 25 to 125 paraded commemorative banners to the Annual Conference stage Friday during the traditional church anniversary celebration. Many will stage homecoming celebrations in their communities as well. From membership rolls carefully penned in faded ink to minutes of trustee meetings to building committee reports documenting dollars raised, materials promised and volunteer labor logged, the congregations of the Florida Conference tell stories of unshakeable faith in the midst of an ever-changing landscape. 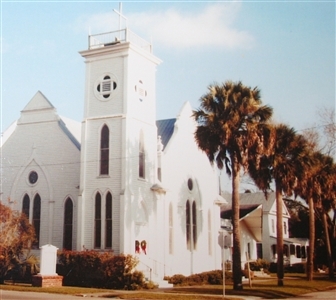 Sardis UMC, for example, came to be in the days of frontier Florida, when settlers from Alabama, Georgia, the Carolinas and other states to the north scraped out livelihoods from the land. Few had time to keep records, but the first Methodist worship services are believed to have been held in 1839 in a log structure that served as schoolhouse and church. A church history by Dorothy Mathers at the Florida Conference archives center tells how Methodists and Baptists shared a building in the 1850s. In 1949, the congregation built the present-day sanctuary on the same site, relying heavily on volunteer labor. The price tag? $3,800. The building was still relatively new when Mike Willis’ parents joined the church in 1951. Willis, now the church council chairperson and cemetery overseer, grew up attending what was then Sardis Memorial Methodist and later Sardis UMC. For many years, the church remained a rural outpost serving neighbors and farm families who lived within a few miles, said Willis, who manages a large farm and runs cattle. Sardis UMC, Monticello, celebrates its founding 175 years ago this year. The sanctuary was built in 1949 on the site of the original structure, believed to be constructed of logs. Photo from Florida UMC Heritage Center. “Over the years, like with so many other communities, agriculture became not so important,” he said. Only a few years ago, the church flirted with closing as Sunday worshipers dwindled to about five. Then Rev. Steve Lenzo took the helm. Located not far from the employment mecca of Tallahassee, the church has become a draw for suburbanites and commuters, Willis said. He credits the pastor with retooling the founding spirit of the church to meet a new generation of worshipers. “Steve relates to young people. He accepts them for who they are and what they are,” Willis said. First UMC, Apalachicola, was founded 175 years ago. The original sanctuary burned in a citywide fire. This structure was built in 1901 and draws tourists interested in history and architecture. Photo from the Florida UMC Heritage Center. For a church to reach its 175th birthday is a big deal in Willis’ book. Many church histories can be found at the Ruth K. and Charles T. Thrift Jr. Florida United Methodist Heritage Center at Florida Southern College in Lakeland. 125 years: Branford UMC; First UMC, Chattahoochee; Trinity UMC, Fort Myers; Fort White UMC; Interlachen UMC; Arlington UMC, Jacksonville; Lake Bird UMC; Grace UMC, Lawtey; Linden UMC; First UMC, St. Petersburg; Little Chapel UMC, Santos. 100 years: First UMC, Avon Park; Dundee UMC; Roseland UMC; First UMC, South Miami; First UMC, Vero Beach; Trinity UMC, West Palm Beach. Also celebrating are First UMC, Eastpoint, 75 years; and Oakhurst UMC, Seminole; Satellite Beach UMC; St. John UMC, Sebring; and Steinhatchee UMC, all 50 years old. Celebrating 25 years are Braden River UMC, Bradenton; Hispanic American of Hialeah; and Covenant UMC, Port Orange. The Florida Conference Commission on Archives and History has produced a booklet, "Celebrate! Ideas for Celebrating Church Anniversaries," that can help church leaders prepare for special commemorations. The booklet is available at the Florida UMC Heritage Center. Call (863) 680-4992 or email thriftmail@aol.com for information.